Plantar fasciitis is no doubt one of the most common presentations that foot and ankle specialists see. Although there are multiple causes for heel pain, biomechanical issues causing strain on the plantar fascia are by far the most common causes. A tight posterior muscle group causing an increase in pronation or even a cavus foot structure will result in inflammation of the fascia and subsequent pain. For most patients, conservative treatment with orthotics, anti-inflammatories, cortisone injections and/or physical therapy will decrease the inciting inflammation and provide relief of symptoms. The treatment dilemma more commonly occurs when this acute inflammation persists and chronic scar tissue forms. When this happens, the body’s inflammatory response stalls and healing no longer takes place. When a patient reaches this recalcitrant state, the practitioner must redirect his or her focus of treatment from decreasing inflammation to stimulating it. 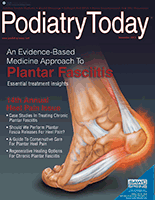 For years, the end-stage treatment for chronic plantar fasciitis has been surgical fasciotomy. We will discuss the newer, less invasive therapy options that are being incorporated in the podiatric practice. Malay and colleagues performed a randomized, double-blinded, multicenter study comparing treatment of chronic heel pain with ESWT versus a placebo.1 The study included 175 patients who had evaluation three months and one year after treatment. On the Visual Analogue Scale, patients who had treatment with ESWT had a mean pain reduction of 3.39 while those treated with the placebo only experienced a pain reduction of 1.78. The patients’ response as to whether they experienced a clinical improvement was also much greater in the ESWT group. More recently, however, research has found that low-energy devices are just as effective in treating the pain associated with plantar fasciitis. Although three separate treatments are required about one to two weeks apart, the procedure can occur in the office and without anesthesia.2 Patients are able to bear weight immediately following the procedure with little to no overall downtime. Another procedure that physicians can perform in the office is known as the RelēF™ procedure (Alpha Orthopaedics). This technology uses noninvasive monopolar capacitive coupled radiofrequency to cause reactivation of the healing process.3 The radiofrequency increases the temperature of the tissue to 50ºC. This increase in temperature subsequently increases the threshold for collagen modulation and tissue shrinkage. The process also recruits macrophages, fibroblasts and heat shock protein factors to the damaged area to aid in the reparative process. Although detrimental to damaged tissues, radiofrequency does not disrupt the healthy fascia. For patient comfort, the treatment wand administers a cool mist prior to the radiofrequency treatment. Two separate procedures are usually required and occur about six weeks apart. The patient is able to ambulate immediately following the procedure with minimal restrictions. A slightly more invasive procedure that occurs in the operating room is commonly known as Topaz (ArthroCare Sports Medicine) microdebridement. This procedure uses a small Coblation wand to increase vascularity and cell proliferation to promote healing. Generally, immediate weightbearing is acceptable in a controlled ankle motion (CAM) boot and patients slowly transition to a regular shoe in about two to four weeks. Other innovative procedures are now emerging that are able to physically remove the offending scar tissue from the diseased area with virtually no incision or recovery time. An example of this is the Tenex procedure, also known as the FAST™ technique (Fasciotomy and Surgical Tenotomy, Tenex Health). Surgeons can perform the procedure with the patient under mild sedation or even with a local anesthetic alone. The technique utilizes ultrasound guidance to evaluate the fascia as well as the scar tissue within it. After making a small stab incision, one would insert the probe, which uses ultrasonic energy to break up and remove diseased tissue. Although powerful enough to break down scar tissue, the frequency is such that it does not affect normal tissue. The surgeon is again able to visualize when adequate scar removal has occurred. After applying a soft dressing, have the patient remain non-weightbearing for about one week with a slow transition to full weightbearing in the next two weeks. In our practice, we have found promising results with this technique for the treatment of not only plantar fasciitis but Achilles tendonitis as well. Likewise, we have had good success in our practice with the use of PRP injections. Patients are generally non-weightbearing anywhere between two to seven days and continue with protected weightbearing in a CAM boot for another week. On the forefront of tissue healing are the topics of stem cell therapy and amniotic membrane allografts. A stem cell injection, most commonly harvested from the lateral calcaneus, provides the damaged tissue with pluripotent mesenchymal cells that differentiate into the appropriate cell type for repair and regeneration. In our practice, we have found a response to treatment at about two weeks but some patients may take up to six weeks to experience improvement in symptoms. The major downfall to this therapy is primarily the expense to the patient as insurance does not cover stem cells. The newest of all therapy options is the use of amniotic membranes to decrease scar formation. Amniotic membrane allograft possesses anti-inflammatory properties, which does differentiate it from all of the aforementioned treatments. Nevertheless, this innovative therapy has a profound impact on decreasing scar formation and promoting growth factors to healing tissue. Zelen and his colleagues conducted a prospective, randomized study assessing the efficacy of amniotic membrane allograft in the treatment of chronic plantar fasciitis.8 In comparison to those receiving a placebo injection of saline, those patients who received micronized dehydrated amniotic membrane allograft demonstrated significant improvement in pain and function at both one and eight weeks. By week eight, AOFAS hindfoot scores increased by a mean of 12.9 for the control group as opposed to 51.6 in the amniotic treatment group. Studies such as this are reassuring that regenerative medicine will have a place in the podiatric practice in the very near future. 1. Malay SD, Pressman MM, Assili A, et al. Extracorporeal shockwave therapy versus placebo for the treatment of chronic proximal plantar fasciitis: Results of a randomized, placebo-controlled, double-blinded multicenter interventional trial. J Foot Ankle Surg. 2006; 45(4):196-210. 2. Weil L, Zuckerman D. Is low-energy ESWT better than high-energy ESWT for plantar fasciitis? Podiatry Today. 2009; 22(11):52-58. 3. Whipple TL. From mini-invasive to non-invasive treatment using monopolar radiofrequency: The next orthopedic frontier. Orthop Clin North Am. 2009; 40(4):531-535. 4. Sorensen MD, Hyer CF, Philbin TM. Percutaneous bipolar radiofrequency microdebridement for recalcitrant proximal plantar fasciosis. J Foot Ankle Surg. 2011; 50(2):165-170. 5. Hormozi J, Lee S, Hong DK. Minimal invasive percutaneous bipolar radiofrequency for plantar fasciotomy: a retrospective study. J Foot Ankle Surg. 2011; 50(3):283-286. 6. Richardson PE, Dix BT, Adeleke AT, et al. Keys to optimal selection of orthobiologics. Podiatry Today. 2013; 26(9):54-61. 7. Barrett SL, Erredge SE. Growth factors for plantar fasciitis? Podiatry Today. 2004; 17(11):36-42. 8. Zelen CM, Poka A, Andrews J. Prospective, randomized, blinded, comparative study of injectable micronized dehydrated amniotic/chorionic membrane allograft for plantar fasciitis: a feasibility study. Foot Ankle Int. 2013. Epub ahead of print.